Honavar (Honnavar, Honawar or Honnavara) is a port town in Uttara Kannada district of Karnataka and a place of great historical relevance. Distance from Shivamogga to Honnavar, Karnataka is 161.4 km and travelling time is around 3 h 28 min via NH69. The first ever historical reference about the Honavar town appears in the works of the Greek author Periplus (AD 247) and it was called Naour. It was mentioned as the first port of Limurike in Tamil country. In the 10th century text Jain Ramayana, the town is mentioned as Hanuruha Island. References about the town are also available in the works of Abu al-Fida (A.D.1273-1331), an Arab Geographer as well as that of Ibn Batuta who described it as the city of Hinaur. Shree Vinayaka temple, Idagunji is one of the popular temples in Karnataka and attracts people from all over the world. The temple is in Idagunji and has the history dating back to the pre historic times. 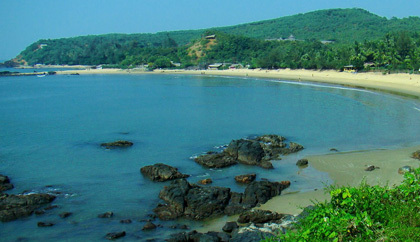 Idagunji is situated at a distance of fifteen kilometers from Honnavar, a small coastal town on the banks of Arabian Sea. On the Bhatkal - Honavar national highway before Mavinakatte (around 17 kms from Honnavar), there is a turn on left side with an arch of Idagunji temple. From the arch the temple is four kilometers away. Colonel Hill is an place of interest in Honavar. It is a 30-meter tall column on the top of a hillock by the side of N-H 17. In 1854, the British, who had invested financially in Honavar, seized Gerusoppa, an independent province ruled by the Queen of Gerusoppa. In the battle that followed, their chief commander (Colonel Hill) was killed. The British erected a colossal column in the Colonel's honor on a hillock. This column was installed in memory of Colonel Hill on 20 January 1845. Today the Column and the surrounding park (built by the local Rotary Club in the early 1980s) serve as the red-light district of the town. The inscription reads, " This column is erected by the 14th Madras Native Infantry A Guard of which Regiment in escorting to their final Earthly resting place The remains of Major General Clement Hill Had The sad duty of paying the last honours active military life. Won the love of every officer And Man with whom he served He died at The Falls of Gairsuppah on the 20th of January 1845 in the����.His age �. whole�The Mysore Division". People of Honavar now call it Karnel Hill. Apsarakonda Falls is a perfect destination to break free from the monotony of routine life. Set in a small village named Apsarakonda in Honnavar taluk of Uttara Kannada district of Karnataka the waterfall possesses enthralling beauty. The scenic location of the waterfall is situated near the Western coast of Karnataka and has a pristine beach in its vicinity apart from a tall hill and a lovely pond. All these elements of nature are enough to mesmerize anyone visiting the place. The waterfall descends from a height of about 50 feet to a natural pond formed below it. The place is as famous for the sparkling waterfall as for the sunset view from the top of the hill. It is a captivating sight to observe the sun setting over the horizon spread beyond the vast stretch of the Arabian Sea. The best time to visit the waterfall is during the monsoon season, i.e., from June to October. The volume of water flowing down the falls is at its highest at that time. However, visitors may have to endure rains while trekking to the falls. The rocks become slippery in the rain and hence caution must be exercised. Distance from Goa to Honnavar is 174.5 km and takes around 3 h 43 min via Edapally - Panvel Highhway. Distance from Bengaluru to Honnavar is 486.2 km and takes around 8 h 35 min via NH4. Distance from Bengaluru to Goa is 560.3 km and takes around 9 h 30 min via NH4. By Bus: There are two National Highways that pass through Honnavar: (1.) NH-17 (Panvel - Edapally): Mumbai, Panjim, Karwar, Udupi,Mangalore and Ernakulam can be reached by this road (2.) NH-206 (Tumakuru - Honnavar): Bengaluru, Tumakuru, Arsikere, Bhadravati, Shivamogga, Sagar and Jog Falls can be reached by this road. KSRTC Rajahamsa Vaibhav Airawat, Shree Kumar Travels, VRL Travels, Sea Bird Tourist are the major operators of Bangalore to Honavar route. Different type of buses are available in this route like Non A/C Sleeper (2+1), Non A/C Seater, Non A/C Airbus, Non A/C Semisleeper, Non A/C Seater & Sleeper.